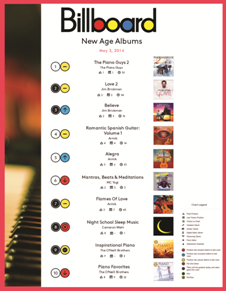 NEW PRAGUE, MINN. (May 2, 2014) - 2014 is proving to be a remarkable year for The O'Neill Brothers, as two of their albums have hit Billboard's New Age Chart multiple times and both of them together most recently as May 3rd. Both CDs, Inspirational Piano and Piano Favorites are compilations of their famous relaxing piano songs, such as "Over the Rainbow," "Unchained Melody," "Amazing Grace" and "How Great Thou Art". These multi-million selling recording artists from New Prague, MN have come a long way from recording their first cassette 20 years ago. Since their start in 1994, they have recorded 38 albums in their relaxing, signature style ranging from holiday favorites, wedding music, Irish songs, classic love songs, lullabies, movie themes, inspirational songs, and more.. The O'Neill Brothers have sold over 10 million copies of their music without the help of a major record label. Tim and Ryan have performed for several governors, US Presidents and have toured with pop superstar Deborah Gibson, as well as Katie McMahon, the original voice of Riverdance. The O'Neill Brothers have provided music for NBC, CBS, ESPN and HBO. Their most recent PBS concert special, "Piano for Someone You Love," was nominated for an Emmy award, and their wedding CD 'A Day to Remember' is the #1 wedding CD in the USA. Publications such as the Los Angeles Times, Minneapolis Star Tribune, Southern Bride and Parenting magazine agree, describing their music as "reflective, soothing, soulful, and stimulating". 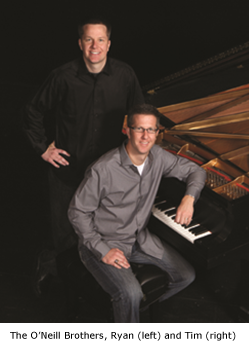 They rave about their "keyboard artistry" and love the "enthusiasm and charming character" of the two brothers in concert.